Chrissy Teigen, John Legend, Jane Fonda, Ryan Phillipe, Adele and Rihanna — what do all these celebrities have in common? They’ve all been spotted undergoing IV Vitamin Drip therapy and many have posted photos of themselves hooked up to IV bags on social media accounts. However, there is no need to be a celebrity to experience the benefits of these vitamin “cocktails.” Many regular people are discovering the power of this therapy to boost energy, improve mood, decrease inflammation, fight cold and flu symptoms, and achieve a bright, glowing complexion. Curious to find out more? Read on! Intravenous (IV) Drip therapy involves the administration of vitamins, minerals, and antioxidants to rapidly improve cellular healing. Normally, cells in the digestive tract facilitate the absorption of nutrients. However, in IV therapy the gut is bypassed with the direct infusion into the bloodstream. The IV method of administration also allows much higher doses to enter the cells than would otherwise be possible. Your body’s cells rapidly obtain nutrients needed to repair, regenerate, and regain strength. That’s why the benefits of IV therapy can often be felt within hours of the treatment, as opposed to days or weeks when taking regular vitamins. What Do IV Vitamin Drips Treat? Since first being developed by Dr. Myers, IV Vitamin Drip formulas have significantly evolved. Today, a doctor well-versed in IV Vitamin Therapy is able to customize the treatment based on a patient’s unique health needs. Higher doses of Vitamin C can be used for those struggling with low immune systems, acute and chronic infections, allergies or even cancer. While extra magnesium can help promote restful sleep, reduce anxiety, relax tense muscles, and help with chronic headaches. An extra dose of vitamin B12 can improve energy, lift mood and even boost metabolism! Larger volume IV bags with added electrolytes are beneficial for patients affected by dehydration, low blood pressure or those suffering from flu-like symptoms. Glutathione, (pronounced glue-ta-thigh-own), is another superstar ingredient. This hardworking molecule acts as a major antioxidant, free radical scavenger, and an essential component of liver detoxification. Recent research even shows its many effects on skin health such as reducing hyperpigmentation and inflammation, thereby promoting that coveted celebrity “glow.” This ingredient can be added to many formulas to boost liver detox, fight signs of aging and brighten the skin. With so many beneficial ingredients available, it can be difficult to choose the best combination. 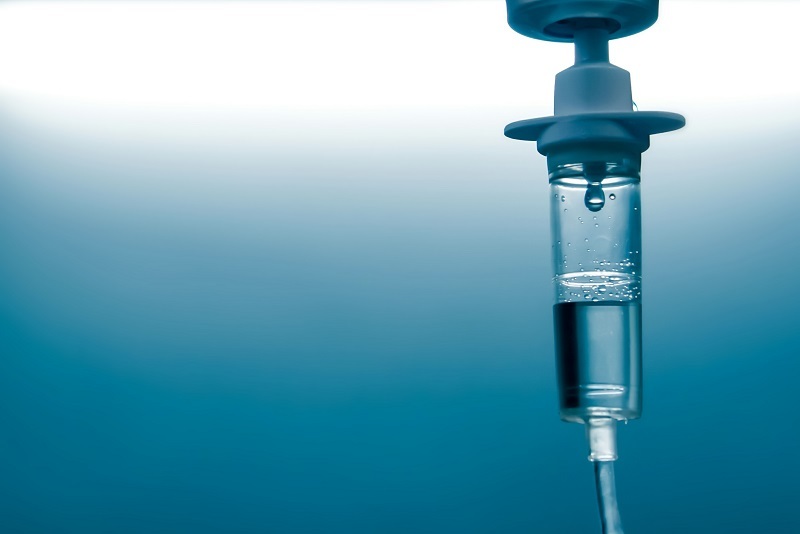 Although many IV Drip formulas focus on addressing a specific health concern, a specially trained IV certified doctor should always be consulted to make sure the IV Drip formula optimally fits your needs. While generally healthy people choose to use IV Vitamin Drips for wellness, beauty and health optimization, research has shown that these treatments carry many benefits for those struggling with serious illnesses. A recent 2012 study demonstrated the safety and efficacy of high dose vitamin C intravenous infusions in patients with cancer (1). The intravenous Vitamin C therapy protocol group had a survival time that was double that of standard treatment alone! Also, this therapy has been shown to significantly improve quality of life for breast cancer patients and significantly reduce inflammation markers, which is important for a better prognosis (2) (3). Just as impressively, the same trial showed that IV vitamin C decreased tumor markers in 77 percent of prostate cancer patients and 73 percent of breast cancer patients. Several clinical studies now clearly demonstrate that intravenous (IV) administration of glutathione significantly improves Parkinson’s disease symptoms, and may very well retard progression of the disease (4). One study also showed that recent heart attack patients benefited from intravenous administration of glutathione due to its anti-oxidant and cell protective effect (5). There is still much research left to uncover the many health benefits offered by this unique treatment. However, the existing studies, though currently limited, offer promising evidence that IV Vitamin Therapy can be safely used by people with various serious health challenges to improve their wellbeing. With the popularity of IV Drip Therapy surging in recent years, many clinics have sprung up hoping to capitalize on the trend. Standards in these facilities can vary widely, which can result in unnecessary health risks for unaware consumers. The first indication of a quality facility is the assessment process. While many “Drip Bars” will offer a-la-carte style service, allowing the patients to choose a procedure without a doctors guidance or medical check, such practices can be risky. Even if the patient seeking treatment is generally healthy, a basic review of medical history and physical is needed to ensure safety. The assessment process will identify any medications, allergies or health conditions that may interact negatively with the IV Vitamin Drip. During the assessment the doctor can also modify the drip formula to cater to the patient’s goals by adjusting the ingredients and concentrations of the IV bag. Other important factors to consider when choosing an IV clinic is the facility staff and policies. You want to ensure that you are visiting a clinic that has a doctor on site at all times. Many IV spas are staffed mainly by medical assistants or nurses, without direct doctor supervision. Another great question to ask when shopping around is when are IV bags prepared? Since IV vitamins tend to lose their potency over time, IV Vitamin bags should be prepared on the day of the treatment only, and never be kept overnight. This ensures the freshest ingredients with the most health benefits. If you’re intrigued about the benefits of IV Vitamin Drips and want to try it out yourself the first step is to book your appointment at a reputable clinic. Your first visit should include an assessment by a doctor knowledgeable in IV Drips, a general physical exam to make sure the treatment is right for you and the IV Vitamin Drip administration. During your assessment, the doctor will discuss your health challenges and goals as well as create a treatment plan specific to your needs outlining the type, frequency and duration of the Vitamin Drip therapy. Prices for IV vitamin Drips can vary depending on your location as well as the specific ingredients used. The typical range is $150-$250 excluding the doctors visit. Many insurance benefit plans may offer full or partial reimbursement for the costs so make sure to check your plan for coverage details. After your assessment, the IV Drip will be prepared for you according to the formula prescribed by the doctor and administered by a qualified medical professional. Once the drip is inserted, you should not experience any discomfort. Many people choose to read, work, nap nor simply relax during their treatment. Depending on the type of treatment selected, the infusion process can take between 30-90 minutes. Upon completion of the treatment, the IV Drip will be disconnected and standard vital signs check performed. You are free to return to all normal activities directly after your treatment. Health benefits can start to be felt within a few hours or days after your first treatment with many patients reporting a boost in energy, mood, improved sleep and better mental performance. Physical improvements to skin, hair and nails can be expected after approximately 4-8 weeks of regular treatments. The facts are in: you don’t need to be a celebrity to experience the multiple health, beauty and performance benefits of IV Vitamin Drip Therapy. Whether you’re looking to turbocharge your energy, fight off an oncoming cold, chill-out after a hectic work-week or glow-up your skin. The correct IV Drip formula could help you reach your wellness goals, quickly, safely, and effectively. Dr. Yelena Deshko ND is a leader in the field of naturopathic intravenous (IV) therapy in Toronto, Canada. She is a general family practitioner with a special interest in integrative oncology, anti-aging medicine, and hormonal health. Dr. Deshko combines traditional and conventional medicine in her practice, including acupuncture, botanical medicine as well as diet and lifestyle counseling. She is the founder of Timeless Health Center. Monti, D.L. et al., “Phase I Evaluation of Intravenous Ascorbic Acid in Combination with Gemcitabine and Erlotinib in Patients with Metastatic Pancreatic Cancer.” PLoS One. 2012; 7(1): e29794. (2) Vollbracht, C. et al., “Intravenous vitamin C administration improves quality of life in breast cancer patients during chemo-/radiotherapy and aftercare: results of a retrospective, multicentre, epidemiological cohort study in Germany.” In Vivo. 2011 Nov-Dec;25(6):983-90. Mikirova, N et al., “Effect of high-dose intravenous vitamin C on inflammation in cancer patients.” J Transl Med. 2012 Sep 11;10:189. (4) Sechi, G. et al., “Reduced intravenous glutathione in the treatment of early Parkinson’s disease.” Prog Neuropsychopharmacol Biol Psychiatry. 1996 Oct;20(7):1159-70. (5) Truscelli, G. et al., “Glutathione sodium salt as a novel adjunctive treatment for acute myocardial infarction.” Med Hypotheses. 2017 May;102:48-50.